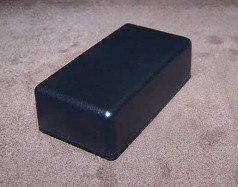 PB-090X13 Small Plastic Project Box for Electronics. This small utility box features a flat bottom cover and molded top cover. 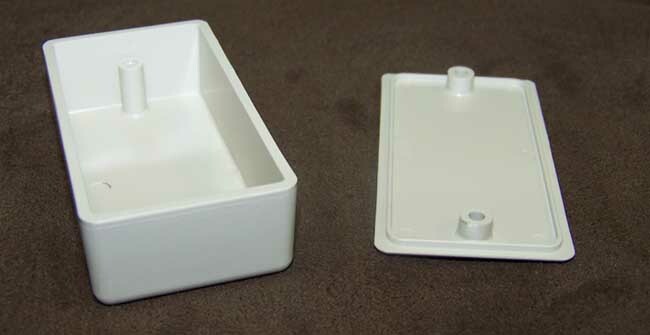 This enclosure is slightly larger that our 075X12 plastic enclosure. It is designed so that a 9 volt battery will lay inside, making it a perfect choice for an external battery pack. There is clearance between the cover and cup for a circuit board to mount. Simply lay the board inside put on the molded cover and use the screws supplied for a complete enclosure. If you need this with a mounting option please see our WM-090X13 Wall Mount Enclosure. This IP65 Utility plastic enclosure is made from high quality ABS plastic and is RoHs Compliant. This file is in a PDF format. This is the drawing for the PB-90X13.